Carlsbad sits at the edge of the Great Plains of middle America - to the east stretch hundreds of miles of flat prairie, used mainly for ranching and oil/gas operations. With a relatively low elevation of 3,400 feet, and summer temperatures that often exceed 100°F, this part of New Mexico is still classed as desert land, part of the Chihuahuan Desert which extends across southeast Arizona, west Texas and the Mexican state of Chihuahua. 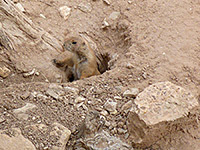 The varied plants and animals of this arid region are exhibited in the Living Desert Zoo and Gardens State Park, which occupies several acres of cacti and yucca-strewn land at the edge of the Ocotillo Hills, overlooking the Pecos River valley just northwest of town. This part of New Mexico is quite remote, and those that do pass by are likely to be en route to or from the nearby Carlsbad Caverns; the Living Desert though well-deserves a diversion of a few hours as it has one of the best collections of desert life in the Southwest (Arizona-Sonora Desert Museum near Tucson is also very good). 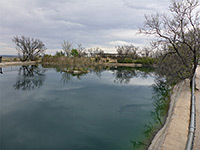 The state park entrance is 4 miles from Carlsbad city center, along Skyline Road just off US 285. There is ample parking but no campground - the nearest (free) camping is provided by the Lincoln National Forest, 30 miles west, in a scenic but little visited area that also has abundant desert plants. Entrance to the zoo and gardens is through a spacious though rather gloomy visitor center, featuring exhibits, a book store, gift shop, rocks and minerals, and a collection of small plants for sale. Pets are prohibited. Like all New Mexico state parks, the entrance charge (2019) is $5 per vehicle. 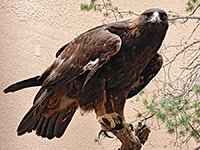 Animals in enclosures include snakes, lizards and birds of prey (golden eagles and hawks), and the park has a walk-through aviary containing humming birds and other colorful species. Reptiles are housed in a recently constructed building on the north side of the complex, at the edge of the hills. 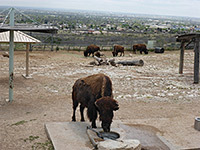 Outside, fenced areas are home to an assortment of large mammals: bison, black bears, bobcats, deer, elk, javelinas (desert pigs), Mexican wolves, mountain lions and pronghorn antelope, while also present are an active colony of prairie dogs, in a walled compound viewable from all angles, and various aquatic species in and around a large pond. 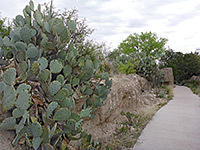 The park grounds include many naturally-growing Chihuahuan desert plants, plus a few non-native species that have been added, and several nature trails lead past many types of cacti, agaves, yuccas, trees and bushes, including the distinctive spiky ocotillo after which the surrounding hills were named. The total length of the various paved walkways is 1.2 miles. Plants are divided amongst four habitats - desert sandhills, gypsum hills, desert uplands, and pinyon-juniper. A more organized and comprehensive collection of cacti and related species is housed within a large building, the Succulent House, which also contains specimens from other parts of the world. Carlsbad has a good selection of hotels, some just a few miles from the state park.